This healthy, filling salad, can be served as a main dish for dinner or lunch, warm or cold. It looks great in a jar if you layer it and pour dressing over, instead of mixing it in a bowl. The salad tastes even better the next day, so it is perfect for lunch prep. Mix all dressing ingredients together in a small jar or bowl and set aside. Preheat the oven to 1500C, place walnuts on a shallow baking tray and roast for 5 minutes tops, until just fragrant. Remove from the oven and leave to cool. Increase the oven temperature to 1800C. Wash and peel beets. Wash the squash. Slice beets and zucchini into rounds. 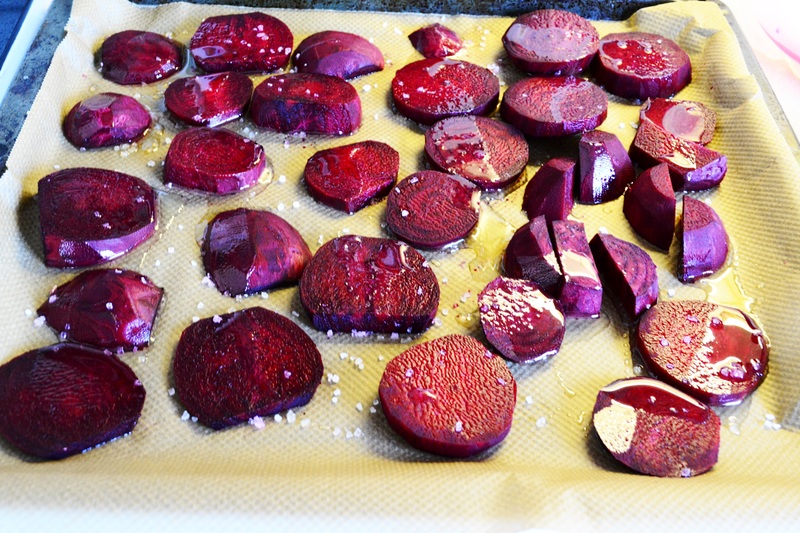 Place beetroot slices in one layer on roasting tray, covered with baking parchment, sprinkle with oil and salt and roast in the oven for about 30 minutes, until the fork can easily go through the rounds. Add zucchini to beetroot for the last 5 minutes of roasting. Remove from the oven and leave to cool. While vegetables are cooking, cook quinoa according to label instructions. Feel free to add vegetable stock instead of salt. When ready, drain and set aside. 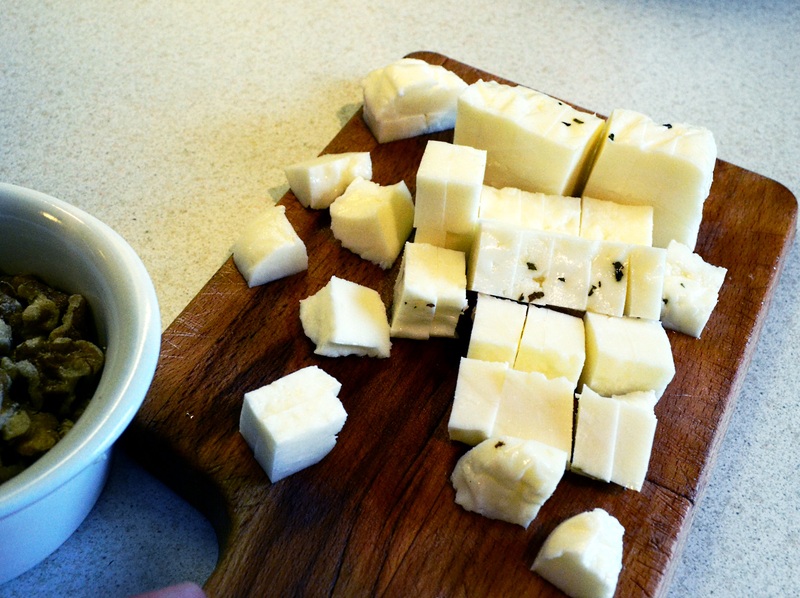 Slice the halloumi block into cubes. When the vegetables are done, place the halloumi on the baking tray and roast for 8-10 minutes until golden brown around edges. Leave to cool. When beets are cool, cut slices into cubes or strips. 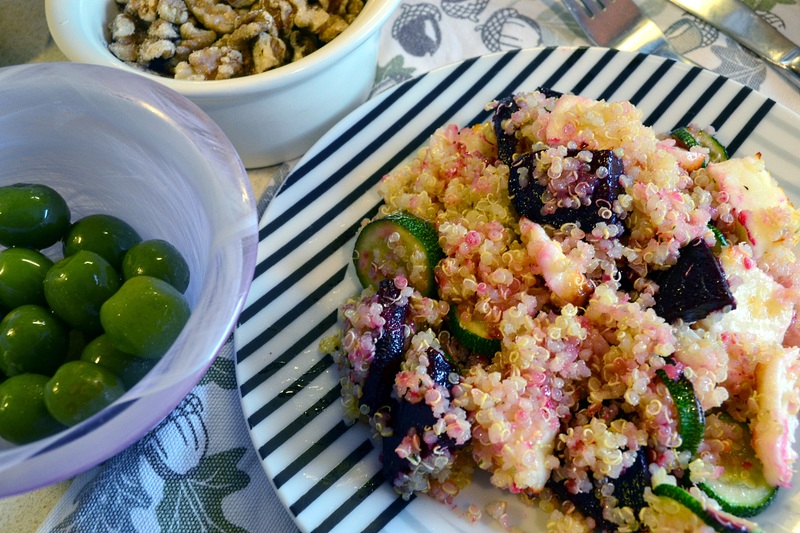 Tip the quinoa into the salad bowl, add beets, zucchini, walnuts and halloumi, pour the dressing over and mix it all together. Serve at once or keep in refrigerator until required.